The Maggie Allesee National Center for Choreography (MANCC) is a dance and choreographic research center at Florida State University (FSU). MANCC offers incomparable opportunities for contemporary choreographers to refine their artistic practice and develop new work in a creative community. MANCC seeks to compliment the activities of FSU’s School of Dance by strengthening and enhancing relationships between dance practitioners operating within and outside of an academic setting. What was the impetus for MANCC’s creation? MANCC came into being through a remarkable convergence of history, opportunity, and vision. There had long been talk of how and when the U.S. might create, model, or adapt one or more national choreographic centers like those of our colleagues’ in Europe (France in particular). Alongside this national conversation there came a moment in time when Chair of the FSU Dance Department (1997-2006), Libby Patenaude, was able to propose a “Center for Excellence” as a major initiative of the University. She developed a proposal for a National Choreographic Center that became the catalyst for the renovation of Montgomery Hall, a 90,000 square foot dance facility. Patenaude used to reference “standing on shoulders,” as a direct tribute to Dr. Nancy Smith Fichter, FSU chair of Dance (1964 – 1997), who had set the stage perfectly for this moment in time. FSU already had a long track record of working with visiting artists and had developed some significant progressive relationships with working professionals like Jawole Willia Jo Zollar of Urban Bush Women and Suzanne Farrell of the Suzanne Farrell Ballet, both of whom are still on faculty. The impetus was not to replicate other models, but to craft one version of a U.S. model within an institution of higher education. It is crucial to invest in the making of work in order to satisfy the future interest and investment in the field of dance. The better the work and the more sophisticated the artists, the better the chance we, as a field, have to increase audiences, distribution outlets, and meaningful exchange. 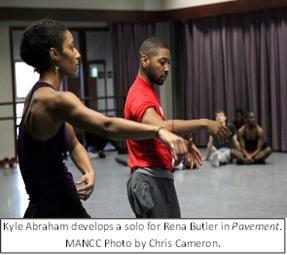 MANCC sets a high bar, as should be expected by our nation’s first National Choreographic Center. The key components are obvious: time, space, and resources; however, it is the way artists put them together, the way they engage with others alongside the fragile and fertile terrain of dance making that makes the experience unique. The methodology includes trust, collaboration, and assumes a mutually beneficial exchange, which works particularly well for us being situated in an institution of higher education. MANCC is a necessary first model to build upon. Who are some of the dance artists MANCC will be working with this year, and what about their work inspires you and your staff? Liz Lerman. We have had the privilege of working closely with several of Lerman’s peers over the years. This year, however, we finally get the opportunity to work with Lerman through multiple residencies to support her latest endeavor, Healing Wars. We have all been touched by the recent wars in Iraq and Afghanistan in one way or another, and through Lerman, her exceptional working process, and a melding of dance, theater, and film, we have an opportunity to reflect alongside one another. This is an important work for our country that will premiere with a three and a half week run at Arena Stage in Washington, DC in 2014. Tere O’Connor. Anyone involved with dance should be mandated to listen to O’Connor articulate his thoughts on the form. In fact, in attempts to channel O’Connor now, please stop reading this and listen to him here. This year we will host our third residency with O’Connor to develop Bleed, which expands upon methods derived from his 30 years of choreographic exploration. The new work will be created by blending three distinct dances: Secret Mary; Poem; and a duet entitled, Sister. Poem, in particular, is an extraordinarily beautiful work that should not be missed. To learn more about Bleed, click here. Emily Johnson. Hosting Johnson is always inspiring. The physicality of her work is like no other. During her sixth residency at MANCC, she will be working on Shore, the third in a trilogy of works defining story and place as they relate to Johnson’s Yup’ik heritage and personal confluences of cultural traditions and contemporary performance work. It is hard not to fall in love with Johnson, but it is the core of her work and artistic vision that keep audiences coming back for more.